Hausbuch Wolfegg, fol. 14r: Sol (the sun). 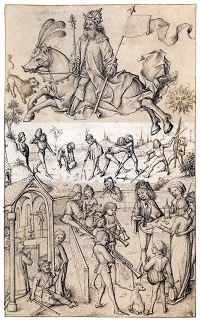 n the last quarter of the 15th century an artist worked as an engraver and draftsman in Germany. His works stand out by an unusual freshness of view and independence in the representation of religious and secular materials. He was an artistic personality who knew to get rid of the constraints of Gothic traditions. In his character this nameless artist was still medieval, for no personal ambition drove him to lift the veil of anonymity: no monogram or date is given anywehere. He is known as the “master of the house book”. The manuscript contains a Latin instruction on memory exercise, summarizes popular astrological teachings of the time in German sayings and in planetary images, and portrays tournaments, army orders, encampment, military equipment, artillery, siege engines, foundries and the like. The manuscript concludes with an older gunsmith regulation. 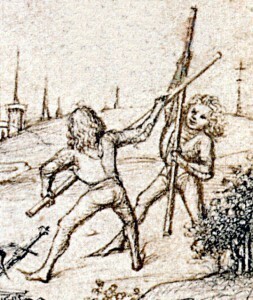 Attached are details from the planetary image „Sol – die Sonne“ (the sun) showing physical training popular at the time. Das Hausbuch. Bilder aus dem deutschen Mittelalter. Insel-Bücherei Nr. 452. Insel Verlag, Leipzig ca. 1930. This entry was posted in Misc and tagged Hausbuch, Hausbuchmeister, Meister des Hausbuchs. Bookmark the permalink.